At Mentco we have spent three generations providing customers with high quality manufacturing services. We were contracted to machine the adapter shown here using our state-of-the-art CNC turning capabilities. 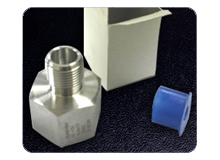 Using 316 Stainless Steel, we employed our CNC lathe for rod cutting and CNC turning to machine this adapter. The final product measured 1.375" and was cut to tolerances of ± 0.002". 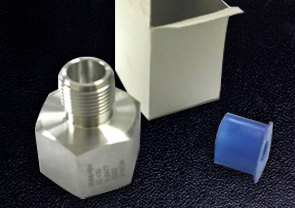 We also provided a full line of secondary machining, including weep hole drilling, deburring, passivation, ultrasonic cleaning, and chemical/laser etching. Each adapter was completed with a 32 Ra finish. The final product met our client's exact specifications, along with stringent ASME and ANSI standards, and our customer in the oil and gas industry was pleased with the results. We now produce 10,000 of these parts per year, with an average turnaround time of 8 weeks plus transit. To learn more about this project, please see the following table or contact us directly. Privacy Site Map Site created by Thomas Web Solutions © 2014, Mentco, Inc.